Mucormycosis is an angio-invasive mycosis said to be the third most common invasive fungal infection. It may present in one of five forms depending on the route of infection. The rhino-orbito-cerebral form of the disease follows inhalation of fungal spores and hyphae. It has been reported to have a seasonal variation in some countries and is usually associated with immune-suppressed states in the affected individuals. The most likely form of mucormycosis presenting to the dental practitioner is the rhino-orbito-cerebral form., This form of the disease is characterized by a fulminating palatal lesion. The characteristic lesion is described as a black necrotic eschar visible intraorally on the palate., This lesion is caused by the angio-invasion and thrombosis of the vessels that feed this tissue. The disease then spreads to the paranasal sinuses and orbital regions by contingent spread and via the blood vessels. The disease enters the brain via the ethmoid and sphenoidal sinuses and may cause a meningoencephalitis. Death is common from this aggressive infection. However, it is a relatively rare disease even among high-risk individuals, accounting for approximately 8–13% of all fungal infections seen at autopsy in such patients in Japan., Accurate epidemiological data could not be accessed for Nigeria. Rhino-orbito-cerebral mucormycosis, like most other forms of mucormycosis, has been associated with immune suppression in affected individuals., This form of mucormycosis is specifically strongly linked with uncontrolled diabetes mellitus and a pattern of anatomic involvement associated with the palate, nasal cavity, antra, orbits, ethmoids, and brain., The infection starts with the inhalation of fungal spores. These spores germinate within the paranasal sinuses of the host. The invading fungi spread inferiorly into the palate, posteriorly to the sphenoidal sinus, laterally to the cavernous sinus, and superiorly to invade the brain. This pattern of spread of the fungi is responsible for the organs affected by this disease. The literature is replete with reports of various antifungal regimens known to be effective against mucormycosis in diabetics. Amphotericin B has been claimed to be the antifungal of choice in the treatment of this infection. Caspofungin and flucytosine are said to be resisted by the organism in in vitro conditions. Newer antifungals such as posaconazole and isavuconazole have also been shown to be effective., Older triazoles such as fluconazole have also been used with some success., Liposomal nystatin has also been used in some successful treatments of mucormycosis in other locations outside the head and neck. 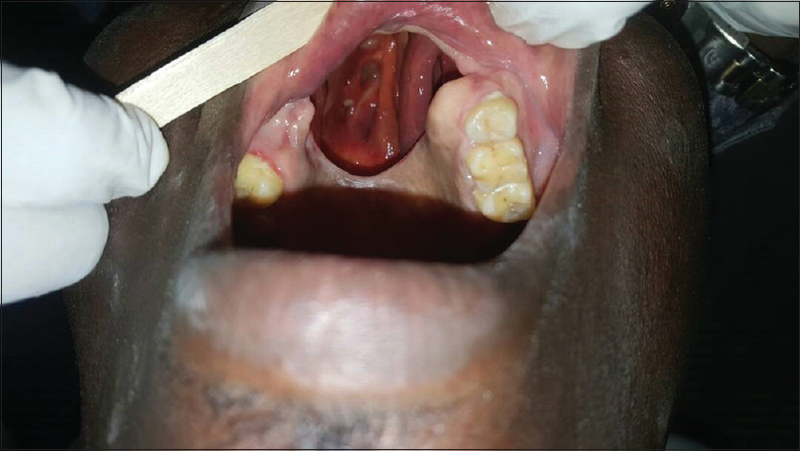 In the treatment of this condition, it is always important to bear in mind that the maxillectomy defects are prone to bacterial superinfection by the oral and respiratory commensals. This superinfection can occur even during rehabilitation. This along with the risk of recurrence of the primary mycosis mandates that patients are placed on long-term review appointments. Honey is a natural product that has been used for medicinal purposes since ancient times. It was used by ancient Egyptians, Chinese, Romans, and Arabs in the Islamic era., In modern times, it has found use as a wound dressing for burns and infective ulcers. A prominent use for honey in infective ulcers is its use in necrotizing fasciitis, which is a life-threatening infection that may affect the head and neck region. Honey is also said to have antiinflammatory properties. This combined with its antibacterial properties makes it a potent agent to stimulate wound healing. The antiinflammatory properties of honey are closely related with its osmotic ability to keep wounds clean and its production of antioxidants., Glucose oxidase present in honey provides leucocytes with glucose. The ensuing respiratory burst and activation of macrophages enhances phagocytosis. There is currently evidence that honey stimulates the production of cytokines such as interleukins and tumor necrosis factor from monocytic cells which improves chemotaxis to wound sites. Honey has also been shown to inhibit the prostaglandins cyclooxygenase 1 and 2 and this immune-modulatory effect is also said to promote healing and tissue regeneration. Honey has been shown to possess some antifungal activity. Several in vitro studies have provided evidence that pure honey can have an inhibitory effect on fungal growth, whereas dilute honey may reduce toxin production. The fungi that have been reported to be amenable to honey treatment include yeasts such as Aspergillus. The Tinea group of dermatophytes have also been shown to be susceptible to honey therapy. Honey is said to mediate at least some of its antifungal properties by immune-modulation. 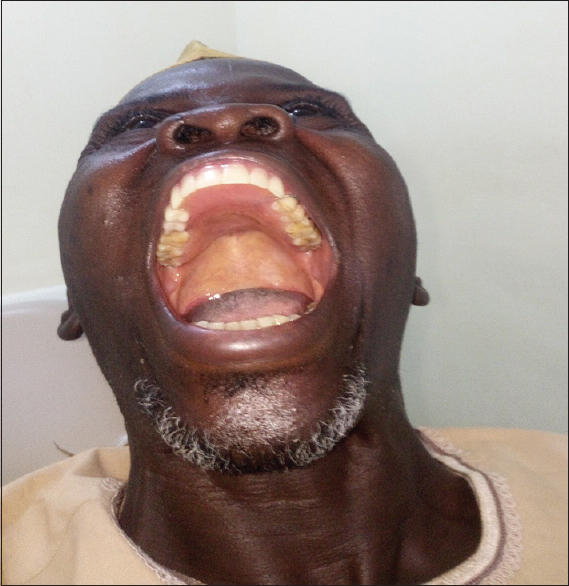 A 47-year-old male diabetic was referred to the oral and maxillofacial surgery clinic of the Aminu Kano Teaching Hospital with an ulcerated foul smelling palatal excoriation [Figure 1]. He had been admitted at a secondary facility prior to his referral. Initial review of the patient revealed grossly elevated blood sugar levels. He was first referred to the department of medicine for attainment of glycemic control. This was achieved after approximately 6 weeks. Radiographic examination with plain imaging was not very helpful. However, computerized tomography revealed a hypodense palate, disappearance of the nasal septum, engorgement of the ethmoids, and a discrete frontal lobe cerebral lesion showing ring enhancement [Figure 2]. A biopsy taken of the palatal tissue revealed the presence of fungal hyphae of the mucorales type. There was no sign of neoplasm on microscopic examination. Features found were consistent with a fungal infection of the tissues. A diagnosis of palatal mucormycosis was made. Because the radiographs showed bone destruction mainly around a discrete centralized area, a clinical decision was taken to commence the patient on antifungal medication to limit the infection and have that segment sequestrate to simplify surgical excision and minimize the risk of recurrence. Patient was commenced on fluconazole tablets 200 mg every 12 hours for 2 weeks, while he tried to procure amphotericin B which was unavailable at the time. He was started on amphotericin B 5 mg/kg body weight daily for 6 days when it became available. He had an uneventful surgery where the excision was without difficulty. The segment was separated out almost wholly. He continued the fluconazole therapy for 7 days while on admission. He was referred to the prosthodontic clinic of the restorative unit for rehabilitation. In the prosthodontic clinic, a diagnosis of an Aramany class VI defect following surgical debridement of tissues affected by invasive fungal infection was made. Patient was provided with a postsurgical obturator after the necessary tooth preparation and placed on a weekly review with a view to fabricate a definitive obturator. Healing initially proved to be uneventful, so patient had an interim obturator fabricated [Figure 3]. The patient subsequently presented with foul smelling whitish discharge from the defect. This led us to a clinical impression of recurrence. We decided to place a topical antifungal dressing on the site to limit any systemic toxicity from antifungals. The interim obturator was used to hold a dressing with topical nystatin against the defect. The nystatin dressing was changed daily by patient for 3 weeks. The nystatin dressings led to a disappearance of smell and discharge from the defect. However, the patient complained of a peppery sensation and headaches and the nystatin was discontinued thereafter. Patient was then placed on multiple rolling review appointments to monitor progress. At one of the review appointments approximately 2 months after he had his interim obturator, patient presented with pain and soreness from the defect. Examination revealed similar foul smell associated with the original lesion and a whitish foul-smelling pus discharge from the defect. 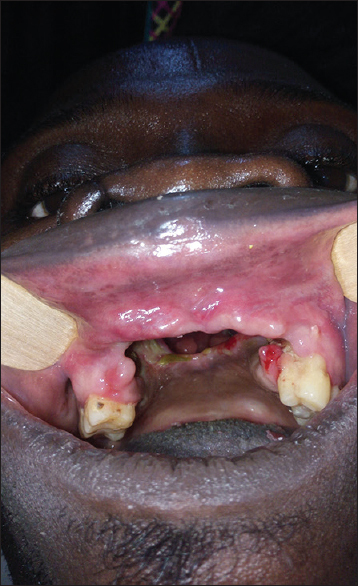 The edges of the defect were also significantly inflamed [Figure 4] with exposure of more devitalized bone and necrotic slough. A clinical assessment of recurrence was made. Swabs were taken for bacteriological culture and sensitivity studies (m/c/s) in case there had been bacterial superinfection. The results of m/c/s tests showed the presence of heterogeneous population of cocci sensitive to amikacin among other antibiotics. Antibacterial chemotherapy was commenced and patient underwent a debridement of the defect under local anesthesia. The debridement required the extraction of two posterior teeth. This made the interim obturator useless to the patient. A new postsurgical obturator/feeding plate was fabricated to hold the surgical pack in place. The feeding plate was held in place with wires and sutures. Healing appeared after 2 weeks, and the team decided to apply a pack impregnated with honey to the defect. This decision stemmed from our awareness of the many pro-healing properties of honey. The patient was advised to procure honey which was used to make a gauze dressing held in place by the feeding plate. This dressing was changed every other day. The patient stopped the antifungal and antibacterial chemotherapy while being placed on the honey dressing. 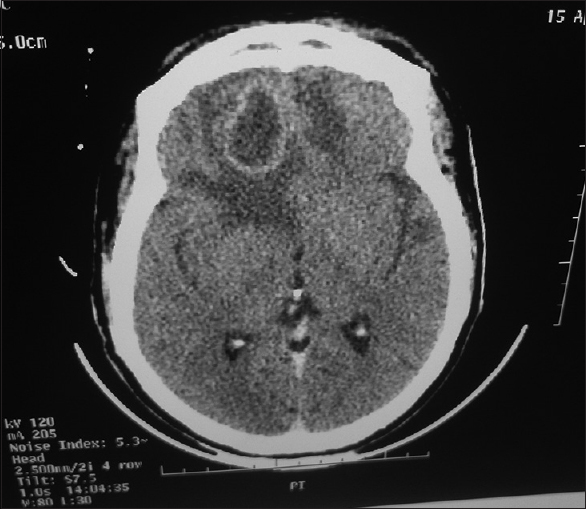 The defect healed and appeared clean after 12 days [Figure 5]. A definitive obturator [Figure 6] was fabricated for the patient from impressions made during the review appointment. The patient has been using his definitive obturator for over 5 months now and appears satisfied with the appliance. He is on regular follow-up. The obturator may require occasional adjustment, and the fear of a recurrence is an ever-present danger. The patient has kept his blood sugar levels under control and continues to keep his appointments with his endocrinologists. Angio-invasive and other deep mycotic lesions of the head and neck region usually present a diagnostic dilemma for the clinician. Rhino-orbito-cerebral mucormycosis may mimic a neoplasm or the destructive invasive mid-line granuloma. These lesions have different etiologies and prognosis to mucormycosis and require more aggressive management. Microscopic examinations for fungi are uncommon when dealing with orofacial swellings due to the relative rarity of fungal infections in this region. However, the nature of the ulcerated palate and radiographic evidence of cerebral affectation led us to order mycotic studies. There is a paucity of national records on the prevalence and incidence of this disease entity, however, it is universally accepted to be rare. The authors suggest that, where there is a high index of suspicion, tissue samples should be sent for fungal studies along with histological investigations. There should also be routine microbiology culture and sensitivity (m/c/s) studies of secretions from swellings. Such early investigations allow the early commencement of treatment and give an aid in choosing the best drugs for adjunctive therapy even in cases that are neoplastic in nature. The nature of the spread of this infection may limit the level of surgical intervention that may be possible for these patients. It may be difficult to achieve a complete resection of the whole of the mass of infected tissue. Cerebral spread may present a rather difficult problem. Resection of cerebral tissue may cause major deficits that may lead to the patient having an unreasonably low quality of life after surgery. The fact that some other forms of mucorales (especially the disseminated cutaneous variant) are managed without excision gave us hope in managing the index patient. Amphotericin B, intravenously the recognized treatment, has been known to have hepatotoxic and nephrotoxic potential, following long-term high-dose administration. This was responsible for our treating patient mainly with the drug only just before surgery. Administration of this drug was discontinued to also limit systemic side-effects. The antifungal therapy was continued with topical nystatin until patient reported untoward effects with its use also in an effort to reduce systemic toxicity. The fluconazole was used in the absence of amphotericin B so that patient will not be off antifungal therapy until the ideal drug was procured. The frustration encountered with routine antifungals and antibiotics led us to apply honey as an adjunctive therapy. The results we obtained seemed to justify our choice of the use of honey. The defect has healed extremely well and this clean state of the defect has been sustained for over an 8-month period. The need for antifungal therapy and episodes of recurrence has diminished considerably. However, the need for regular reviews is still paramount in our minds and patient is still on continuing reviews. The patient had a neurosurgical review. The neurosurgeons did approve of our treatment plan. They shared our opinion that resection of the maxillary sequestrum along with adequate doses of amphotericin B would be sufficient therapy for the cerebral component of the disease. The prosthetic rehabilitation of the patient followed accepted protocols. The fabrication of the definitive obturators was with a chrome cobalt metal framework in keeping with international best practices. The definitive obturator was fabricated using the technique by Ikusika et al. The prosthetic aspect of management was extremely tedious due to infrastructural shortfalls within the center. The skill and expertise for prosthetic rehabilitation exists in the country, but there is a need to improve the scope of the facilities available to the consultants and technologists. 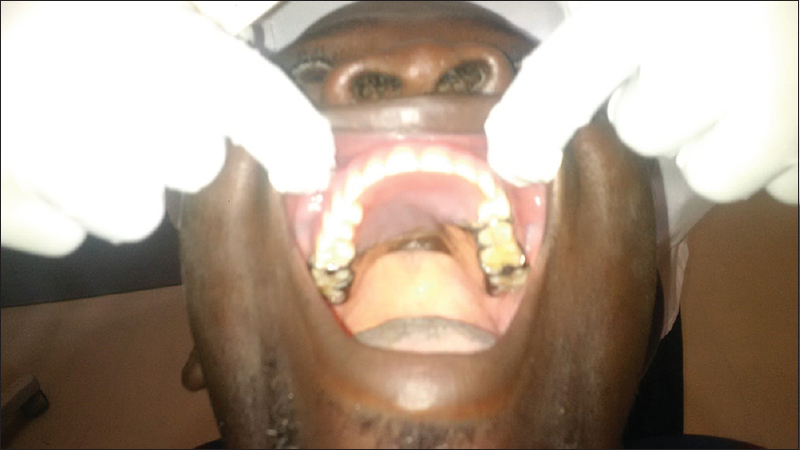 The era of acrylic-based prosthesis should gradually be phased out of our tertiary centers. 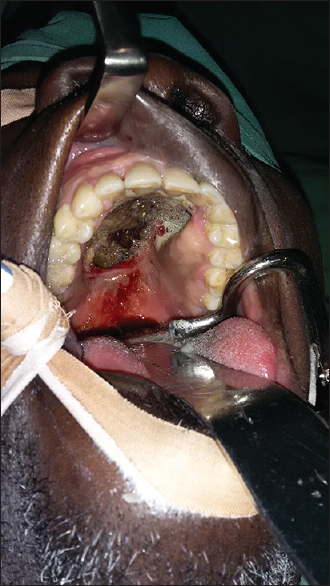 Mucormycotic infection of the palate and associated structures can be managed by surgical debridement and potent antifungal therapy with long-term follow-up reviews. Honey as a topical dressing can significantly hasten healing and granulation of the surgical defect. Eucker J, Secer O, Graf B, Possinger K. Mucormycoses. Mycoses 2001;44:253-60. Ribes JA, Vonover-Sams CL, Baker DJ. Zygomycetes in human disease. Clin Microbiol Rev 2000;13:236-301. Prablus RM, Patel K. Mucormycosis and entomophthoramycosis: A review of the clinical manifestations, diagnosis and treatment. Clin Microbiol Infect 2004;10:S31-47. Talmi YP, Goldschmeid-Reouven A, Bakon M, Barschack I, Wolf M, Horowitz Z, et al. Rhino-orbital and rhino-orbito-cerebral mucormycosis. Otolaryngol head Neck Surg 2002;127:22-31. Petrikkos G, Skiada A, Lortholary O, Roilides E, Walsh TJ, Kontoyiannis DP. Epidemiology and clinical manifestation of mucormycosis. Clin Infect Dis 2012;54:S23-34. Hossecini SM, Borghei P. Rhinocerebral mucormycosis: Pathways of spread. Eur Arch Otorhinolaryngol 2005;262:932-8. Kume H, Yamazaki T, Abe M, Tanuma H, Okudaira M, Okayasu I. increase in aspergillosis and severe mycotic infection in patients with leukemia and MDS: Comparison of the data from the Annual of the pathological autopsy cases in Japan in 1989, 1993 and 1997. Path Intern 2003;53:744-50. Hotchi M, Okada M, Nasu T. Present state of fungal infections in autopsy cases in Japan. Am J Clin Pathol 1980;74:410-6. Roden MM, Zaoutis TE, Buchanan WL, Knudsen TA, Sarkisova TA, Schaufele RL, et al. Epidemiology and outcome of mucormycosis: A review of 929 reported cases. Clin Infect Dis 2005;41:634-53. Skiada A, Pagano I, Groll A, Zimmerli S, Dupont B, Lagrou K, et al. Zygomycosis in Europe: Analysis of 230 cases accrued by the registry of the European Confederation of Medical Mycology (ECMM) Working Group on Zygomycosis between 2005 and 2007. Clin Microbiol Infect 2011;17:1859-67. Pearson-Stuttard J, Blundell S, Harris T, Cook DG, Critchley J. Lancet Diabetes. Diabetes and infection: Assessing the association with glycaemic control in population based studies. Endocrinology 2016;4:148-58. Abu El-Naj I, Leiser Y, Wolff A, Peled M. The surgical management of rhinocerebral mucormycosis. J Craniomaxillofac Surg 2013;41:291-5. Nau R, Sorgel F, Eiffert H. Penetration of drugs through the blood-cerebrospinal fluid/blood-brain barrier for treatment of central nervous system infections. Clin Microbiol Rev 2010;23:858-83. Funada H, Miyake Y, Kanamori K, Okafuji K, Machi T, Matsuda T. Fluconazole therapy for pulmonary mucormycosis complicating acute leukaemia. Jpn J Med 1989;28:228-31. Sugar AM, Liu XP. Combination antifungal therapy in treatment of murine pulmonary mucormycosis: Roles of quinolones and azoles. Antimicob Agents Chemother 2000;44:2004-6. Mileshkin L, Slavin M, Seymour JF, McKenzie A. Successful treatment of rhinocerebral zygomycosis using liposomal nystatin. Leuk Lymphoma 2001;42:1119-23. Mandal MD, Mandal S. Honey: Its medicinal property and anti-bacterial activity. Asian Pac J Trop Biomed 2011;1:154-6. Saikaly SK, Khachemoune A. Honey and wound healing: An update. Am J Clin Dermatol 2017;18:237-51. Rajput A, Wassem, Samad A, Khanzada TW, Shaikk GM, Shama GA. Mortality in necrotizing fasciitis. J Ayub Med Coll Abbottabad 2008;20:96-8. Lee DS, Sinno S, Khachemoune A. Honey and wound healing. Am J Clin Dermatol 2011;12:181-90. Alvarez-Suarez JS, Tulipani S, Romandini S, Bertoli E, Bettino M. Contribution of honey in nutrition and human health: A review. Mediterr J Nutr Metab 2010;3:15-23. Tonks A, Cooper RA, Jones KP, Parton J. Honey stimulates inflammatory cytokine production from monocytes. Cytokine 2003;21:242-7. Al-Waili NS, Boni NS. Natural honey lowers plasma prostaglandin concentrations in normal individuals. J Med Food 2003;8:120-33. Efem SE, Udoh KT, Iwara CI. The antimicrobial spectrum of honey and its clinical significance. Infection 1992;20:227-9. Nikaein D, Khosravi AR, Moosavi Z, Shokri H, Erfanmanesh A, Ghorbani-Chohoglo H, et al. Effect of honey as an immunomodulator against invasive aspergillosis in BALB/c mice. J Agric Res 2014;53:84-90. Al-Waili NS. An alternative treatment for pityriasis versicolor, tinea cruris, tinea corporis and tinea faciei with topical application of honey, olive oil and beeswax mixture: An open pilot study. Complement Ther Med 2004;12:45-7. Lyman C, Walsh T. Systemically administered antifungal agents. Drugs 1992;44:9-35. Ikusika OF, Dosumu OO, Ajayi DM, Ogunrinde TJ. Effect of resilient lining of obturator bulbs on patients with maxillectomies. J Prosthet Dent 2016;116:932-6.